I’ve been waiting for this DVD ever since I saw the movie in theaters. Finally, it’s here! Rumors about bad packaging and poor bonus features have been flying around the internet for weeks…is it true? Let’s find out with my review of There Will Be Blood: 2-Disc Collector’s Edition. The first thing you hear in this movie is a dissonant string note. Then the words “There Will Be Blood” pop up on screen. It’s not a title. It’s a statement. Before one line of dialogue is spoken in the film (about twenty minutes in) the filmmaking crew behind “There Will Be Blood” perfectly illustrates the kind of world the characters inhabit, so that when the real action starts, no exposition for how all of this works is needed. As Daniel Plainview, Daniel Day-Lewis delivers the first lines. He discusses why his oil business is better than everyone else’s. He is a family man and an honest business man...or is he? Plainview certainly seems trustworthy and friendly, and his business methods are no doubt superior to the competition. But even in this first scene, Plainview also emanates a small trace of something we don’t like, and the viewer can’t put his or her finger on it just yet. Madness turns out to be the right word, but we find that out a bit later on. The plot revolves around this oil tycoon buying out all the land in an area and inviting the residents to come work in his new oil well. The leader of the community, Eli Sunday, a man of God and ‘faith healer,’ butts heads with Daniel throughout, trying to bring God into a situation that seems God-forsaken. But are his intentions pure? Are anyone’s intentions even straightforward in this film? I’m not sure. This is a film that demands repeated viewings to get the full message. The film is, sometimes, slow and meandering, but this gives it its power. Slow scenes of Daniel walking around and working on oil or simply being crazy make the character even more haunting---this is a character piece. Slow scenes also draw you into the world that Paul Thomas Anderson has created; it’s great to linger on these moments. Daniel Day-Lewis gives the best performance of the year, not to mention one of the best of all time, as Daniel Plainview. He draws you in completely, gets under your skin, and plays with your head. Up until the credits roll, he has completely taken the viewer by force and the performance is nothing short of haunting and disturbing. His Oscar was well deserved. Paul Dano as Eli Sunday is also very good, and complements Day-Lewis’ gargantuan performance with a quieter, more reserved insanity. The acting across the board is phenomenal. The music, composed by Radiohead’s Jonny Greenwood, is one of the single most haunting scores I’ve ever heard. Every note of every instrument has deep, haunting meaning. It gives you as much insight into the character of Daniel Plainview as Day-Lewis’ performance. Every note is timed to perfection within the film, and the result strengthens the film many times over. The fact that Greenwood wasn’t even up for Best Score at this year’s Oscars just proves that the ceremony has little merit. I also would be doing a bad thing if I didn’t mention the gorgeous cinematography. There are some really terrific shots throughout, most noticeable in a set-piece where an oil well sets on fire. It really enhances the film, and I’m glad it won the Oscar. There Will Be Blood reeks of brilliance. As I said above, the film begins with a statement—“There Will Be Blood.” The film spends 2 and a half hours supporting this statement, and at the end, it flashes the statement again. “There Will Be Blood.” It’s as if to say “We told you so.” It’s the brilliant little touches like this that make the film a classic for the ages. 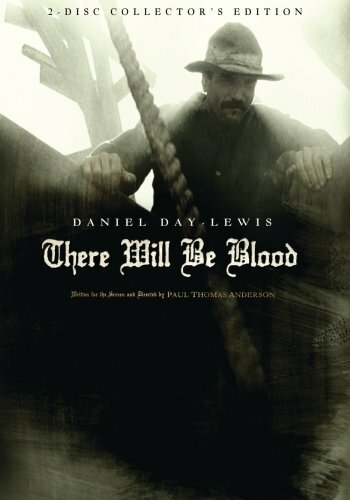 There Will Be Blood is available on DVD in two versions—a one disc and a two disc. Disc one is the same in both sets, and it contains just the film. So let’s start by examining the video and audio quality. The disc boasts an impressive image that recreates the 35 mm experience very well. The 2.35:1 anamorphic video is very sharp throughout—so sharp you could cut butter with it. The detail is very strong in every scene, and colors are constantly vibrant. Outdoor panoramic shots of nature are a wonder to behold. If that was the end of the story, this would be a near-perfect image, but sadly, it isn’t. The contrast is good, but not great. In dark or dimly lit interiors, contrast is fairly weak, and blacks turn into gray, becoming fuzzy. This robs the image of its fine detail and vibrant colors. Some dark images are very hard to make out; this is mostly in the latter half of the film. There’s also a surprising amount of digital noise on the image—strange images created on complex image patterns within the picture. This is noticeable on anything ranging from the mid-ground to the far-ground on interior shots, or on complex outdoor shots. Facial features are very sharp and vibrant in close-up, but become progressively muddier the farther back they get. This is a combination of poor contrast and digital noise—together, the two create a softness to some scenes that shouldn’t be there. But when this image is good, it is great; many shots look hi-def. Overall, this is a great image, marred by some imperfections. These visual problems don’t appear extremely often, and home theater enthusiasts should enjoy, if not go ga-ga for, this image. The audio fares a bit better. From the opening string note, you can hear the crispness to the sound. Throughout the film, most sound effects, be they explosions or footsteps, come through very clearly. Like No Country For Old Men, the film uses sound to create atmosphere, and every effect is important. However, the audio track on There Will Be Blood lacks the crunch that the No Country DVD possessed. For instance, the scene where the oil rig lights on fire has many, many sound effects; some of them get lost in the mix, and a tad of power is taken from the scene. Sometimes, music overpowers dialogue, but this is rare. Neither of these problems were issues on the No Country DVD. But most of the time, this is a phenomenal audio track. It just lacks the bite that similar audio tracks have possessed. Despite imperfections, the A/V experience is very good, and comes close to emulating the theatrical experience. This is a strange movie; there’s no questioning that. Brilliant, yes; but strange. As such, every element of the DVD seems to reflect that, right down to the packaging and extras. Disc Two holds all the bonus features. At first, these seem sparse. There is less than an hour of content. There’s no commentary or any making-of features of any kind. I was dismayed about this, but as I thought about it, I figured out that this is a film that should speak for itself. I don’t want to know how it was made. I don’t want to know how Daniel Day-Lewis perfected his performance, and I don’t want to learn how effects were achieved and sets were built. That would take away the magic of this film. The DVD creators knew this, and the small extras section follows this theme. Every extra extends your understanding of the themes and feeling of the movie, without spoiling how it was made. The first feature is called 15 Minutes, and is, not surprisingly, 15 minutes long. It is a collection of pictures and video clips that served as research to make the look of the film. There will be a few photos, and then a clip from the film. This not only helps your understanding of the technicalities of the film, but also shows how accurate it is. It’s set to Johnny Greenwood’s score, and is very fun to watch. Next is the Teaser Trailer (1:24) and the Theatrical Trailer (2:12). Simply put, these were two of the best trailers ever made, especially the second one. They’re like great short films, and I’m glad to have them on DVD. There’s also two deleted scenes. The first, Fishing (6:14) is a scene after the fire, where workers fish for tools they lost in the well. This was best left on the cutting room floor, but is very cool to see as an extra. The second, Haircut/Interrupted Hymn (3:14) is essentially a montage of deleted and extended clips, centered around Daniel and his son. I actually think some of this stuff should have been in the film; it’s great to see. Better yet, both these scenes are fully scored. Dailies Gone Wild (3:14) is a clip from the filming of the diner scene towards the end. Basically, it shows Day-Lewis trying to stay in character while improvising evil, malicious dialogue. You realize that Day-Lewis LIVED this character. It’s cool, but somewhat breaks the theme of this disc; the theme is to not take you out of the film experience, and when Day-Lewis breaks character and laughs at the end, it takes you out of the experience. All this material is available to play at the same time, and runs about 31 minutes total. All of it is in Anamorphic Widescreen, and looks gorgeous. But there is one more bonus on Disc Two, and it is the best of them all. It even gets it own menu. The Story of Petroleum (25:32) is a black and white silent film from 1923. Produced by Standard Oil and the U.S. government, it served to show citizens how oil drilling was done. Simply put, this is fascinating. It goes in depth into the process, and not only enhances your understanding of oil, but of There Will Be Blood as well. Johnny Greenwood’s score plays over the movie. It’s in 4x3 fullscreen (understandably) and looks fairly good for being 80 years old. In total, there are 56 minutes of content on this disc. Every second of it is phenomenal, and does exactly what it should. It lets the movie speak for itself, but gives the viewer greater insight as well. I might have liked more of this kind of content, but all of this is so good that I can overlook that. The packaging is as strange as the extras. The two discs are housed in a fold-out cardboard case; the sleeve, which folds together, is housed in a cardboard sleeve. The whole thing is a little less thick than a regular plastic DVD case---and it is darn cool. I have to give props to the cover art—it isn’t the poster art, but it isn’t a sloppy photo shopped cover either. You can look at a picture at the top of this page; it looks like a photograph redrawn by hand, and it is very, very cool. It emulates the feel of the brilliant artwork the Criterion Collection puts out. The inside cardboard case has a picture of Daniel, H.W., and Paul talking from early in the film. One section of the foldout has an excerpt from the book “Oil,” the inspiration for the film. The discs are housed in slits in the cardboard. All of this is really cool looking, and emulates an 1800’s feel. Sadly, the way the discs are housed is so tight that pulling the discs out can cause small scratches. Playing was unaffected on my disc, but this is still a problem. I would suggest switching discs one and two—the area for disc two is less tight, and causes almost no scratches. The menus on both discs are static—that is, they don’t move at all. It’s just a photo from the film, and each segment of the menu goes up over the picture. The DVD creators went for absolute understatement here, and it works in context of the film. My only quibble with this understatement theme is that they split the 2 hour, 40 minute movie in 8 long chapters. I get that they are trying to make it feel like a book or something, but that is a bit tedious. The extras are great and the packaging is cool, if a bit unsafe for discs. This is a 2-Disc set that delivers. This is a great film, one that everyone should see. The 2-Disc DVD does not disappoint, with great, if slightly flawed, A/V quality and very cool extras and packaging. The extras aren’t something everyone will enjoy; if you’re not a bonus features fan in the first place, disc 2 won’t change your mind. Casual fans should stick with the one disc version, but if you want something more substantial for just a few dollars more, the 2-Disc DVD gets my high recommendation.